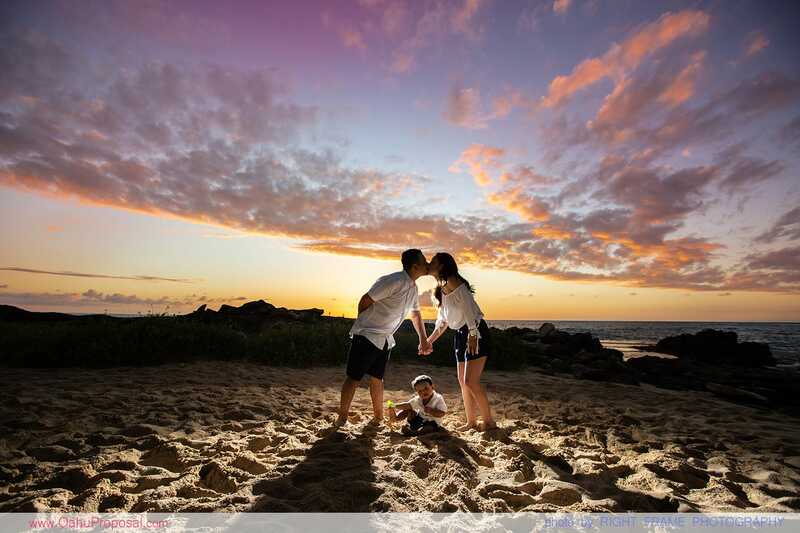 We are a husband and wife team of professional photographers, based in Honolulu, Oahu. After years of photographing happy couples during their special moments, we have decided to expand our expertise to also help plan the proposal and make it a memorable event. We’ve provided countless couples with beautiful photos in the most romantic settings and breathtaking backgrounds, to share with family and friends for many years to come. As your guides, we take you through the proposal planning process in a flawless step by step way that flows naturally with your vacation plans. setting things up to keep the surprise completely under the wraps? without clueing your fiancé beforehand. The only thing you need to do is buy the right ring! beautiful photos. We are here to help you organize your romantic dream! We offer several Oahu proposal packages, specially designed to meet your individual idealistic desires. Each Oahu proposal package can be modified to your specific ideas, wants or needs. Do you want to propose in Hawaii but just don't know where to start planning? "There guys are amazing. They did our engagement shoot. Our photos are awesome me thank you to Ania and Radek. They communicate great with plans and give you lots of options. I highly recommend these guys to everyone wanting to make special memories." "Ania and Radek are two of the nicest people you will meet. They are extremely flexible and can adjust to what you want and need. They understand the importance of the event you have at hand and they make your event personal to them. Their photography skills are top notch and the customer service is above the bar by far. If you're on Oahu and want to set up a photo shoot, no matter what kind. They will meet you with unparalleled professionalism and service. You won't regret booking this team for your next photoshoot needs." "These two are fantastic. I had planned for months to travel to Honolulu and propose, and I reached out to Right Frame on Facebook three months ahead of time. Not only were they very responsive, but they recommended locations that would be great for me to propose! It paid off, too, because the photos are extremely picturesque, and they will be a memory we will treasure forever. If that's not enough, they even gave us a ride back into Honolulu after we took a taxi to the proposal shoot location! 🙂 They are the nicest, most professional people." "I can't say enough about Ania and Radek of Right Frame Photography!! Like many others I flocked to review sites looking for an engagement photographer. As many groom's will tell you, the first plan for proposal doesn't always pan out. So i was on to plan 2 and that involved frantically searching for an engagement photographer in Hawaii, 12 days out no less. Well if you happen to be in my same shoes, search no further and book whatever opening they have available!! This couple is beyond amazing!! From the prompt email returns to helping with choosing locations, everything went as smooth as can be. I wanted a location that screamed Hawaii and they beyond exceeded all expectations!! Their friendliness, professionalism, and patience does not go unnoticed!! Many many thanks to this talented couple!!" "It all started after I decided to propose to my girlfriend during our vacation to Oahu. I came up with the brilliant idea (haha) to do a surprise photo shoot. I scoured the internet for photographers, having never hired a photographer before I really had no idea what I was looking for or what to expect. I came across Right Frame's website. Though I didn't have much to compare to, their online portfolio blew me away. I emailed them with a general concept of what I had in mind but I was really just looking for suggestions. Ania wrote back with a very detailed explanation and some suggestions on how to setup and execute the surprise proposal/photo shoot including great location recommendations on Oahu. Granted, this was months before our actual trip. During these couple months leading up to the trip, I regularly emailed Ania w/ various questions in which she was totally patient and answered all of them. She even sent me some step by step directions and photo examples of where they would be set up on the day of the shoot. Fast forward to the day of the proposal/photo shoot. Ania and Radek showed up early and set up exactly how we had planned to capture the surprise moment. The "surprise" didn't go exactly as I had planned because my girlfriend started getting suspicious! 🙂 but Ania and Radek played along and it worked out wonderfully! My fiancé and I aren't really the type to go out of our way for attention nor are we very experienced with photo shoots. You could instantly tell that they were experienced and knew exactly what they were doing down to very minor details that my fiancé and I would never have thought of. They were patient and catered to what we were looking for. With them being so friendly, we were comfortable the entire time. We had chosen to do photos in two locations. After the first location, they even gave us a couple bottles of water (since we had forgotten some) and they tied a ribbon to their car so we could easily follow their lead. These little details don't sound like much but you don't get that kind of service and attention to detail everywhere. After the shoot, we anticipated receiving the photos. During this time we thought to ourselves that there was no way our photos would look like they do on their website portfolio. A little over a week later we received the online link from Ania and we were completely blown away by how the photos turned out! Personally, I typically hate how I look in photos, but Ania and Radek must have really worked their magic. My fiancé and I couldn't be happier. We look forward to posting our photos everywhere for everyone to see. Just an overall great experience and great pictures at a great price! The other reviews on here aren't by mistake. They deserve every one of the 5 stars. HIGHLY recommended. We'll be using them if our plan to marry in Hawaii works out..."
"Ania and Radek are by far the best photographers ever!! They helped me plan a dream proposal for my fiancé!!. They are great and helpful and did an amazing job!! For months we secretly planned a surprise proposal with a photoshoot for my fiancé and everything turned out even better than planned. They helped me pic a great location, and to stage everything I wanted for the proposal. The final pictures also turned out amazing and the price was also great!!! I will definitely love to work with them again for our wedding if we do it in Hawaii!. I am just infinitely great full for all the great work they put into our surprise proposal/photoshoot!! Everything was just perfect... 🙂 Thank you Ania and Radek you guys are great!!!" "Ania and Radek are great photographers! They shot our engagement/proposal photos and helped my fiancé by giving him a list of locations that are away from tourists and show natural Oahu beauty. They assisted him by setting up a heart shaped on the sand covered in flower petals on the beach were he blindfolded me and walked me to the special proposal spot. They took beautiful photos and captured our chemistry while getting the amazing backdrop from the island. They were prompt through email and text before and following the photo shoot, the photos were ready to view and print less than a week after the shoot. The vibe of the photos were fun and romantic! My fiancé and I were extremely pleased with their services! The pictures speak for themselves!" "I cannot recommend Right Frame Photography enough. During our first visit to Oahu, I decided it was the perfect trip to propose to my now fiancée. Ania and Radek were readily available and assisted with picking the perfect location for a surprise photo shoot, and they further assisted with setting up the right moment to capture the proposal. Ania helped coordinate the date and times as well as answer any questions I had; and when the day came, Radek was on-site in advance and waiting for our arrival with our predetermined plan (further to this, they checked in with me and ensured I would be able to make the time/location). He faked being a tourist, taking photos of the scenery, and he played along when I staged a moment for him to take our photo with my cell phone. He used this moment to better place us for the perfect shot when I would ask the question; and the whole time, he never broke character. It was perfect. Our session was supposed to be one location for an hour, but Radek offered to drive us down to the beach since it was nearby to grab a few extra photos before the session ended. That day, it was overcast, and the sun didn't really show much; however, the photos still came out fantastic. Radek's knowledge and skill with manipulating the camera and post-production photos is superior. One last note, we never had a professional photo shoot performed, and Radek's personality and demeanor made us feel comfortable and at-ease throughout the session. During our shoot, Radek captured some of the smaller moments as well as posed shots; and if we were ever locked up or not sure what to do, then he would give ask us to perform some action or look a certain way so that he could capture the scene. The location was excellent. The price was excellent. And, the professionalism, skill, and quality are, and will continue to be, excellent. All in all, go with Right Frame Photography. You won't be disappointed." "I had the pleasure of working with Ania and Radek last month in Oahu. Ania was very responsive, offered multiple suggestions and details as I had never been to Hawaii before and was proposing to my girlfriend who is now my fiancé! We chose Makapu’u Point which turned out to be better than expected. Everything went as planned and our photos came out amazing! Radek was experienced, very fun to work with and I would highly recommend Right Frame Photography to anyone that is planning on having engagement, wedding or any other photos taken. Cheers and all the best in 2018!" "Ania and Radek, the owners and photographers for Right Frame Photography are great! We did our engagement session with them and had a great time. They had a fantastic package that allowed us to take photos at four different locations with a great variation in background. When our sunset photo session was rained out, they were happy to reschedule the session even after we had all driven an hour to the location. While packages are booked in allotments of hours, Ania and Radek do not rush the process and put the emphasis not on time, but in quality photos. They were happy to try out any of our ideas and posed us when we didn't know what to do! We ended up with a stunning collection of photos and received everything in 2 weeks." "My fiancé and I booked this wonderful photographer to shoot our engagement photos and we couldn't be happier! They had wonderful locations for us to shoot at and were incredibly professional. Radoslaw and his wife captured my fiancé and I's personality and the beauty around us. We received our photos only a short time after the shoot and they were INCREDIBLE! They also offer a wonderful professionally bound book of your photos--highly recommend!! We are local to the island and can't wait to have them shoot our wedding and family milestones in the future. Whether you are local or coming to Oahu for a wedding or engagement , I would highly recommend using Radoslaw for all your photo needs. Thank you, thank you, thank you for capturing our engagement in such a beautiful way!" "My fiancé and I were vacationing in Waikiki so thought having our engagement photos there would be best since Hawaii has the most beautiful beaches. We found Right Frame Photography through Yelp and wee not disappointed with their photos. They came out BEAUTIFUL!!! we can't wait to go back with our whole family and have another shoot with them. HIGHLY recommend them!!" "Ania and Radek are great! Radek was our photographer and he was absolutely fantastic! We came with no props and he had brought some along to add to our shoot which came out beautifully. He was also very helpful in positioning my fiancé and I during the shoot including hand placements and where to look. We were able to capture both daylight and sunset for our 1 hour shoot which we loved. I highly recommend them for any occasion!" "My fiancé and I were very pleased with our engagement photos! The photos turned out better than I could have imagined! Beautiful, beautiful photography, and I couldn't be happier. We ordered some large canvas prints, which also turned out amazing. Thank you Ania and Radek. "My fiancé and I had Ania and Radek take photos of us while we were in Oahu. From the initial point of contact to well after we received the photos they were extremely helpful, easy to work with and very responsive to any questions we had. The photos they took of us were AMAZING and the locations they recommended were phenomenal! If you have any doubts or are unsure of where you want to have your photos taken, tell them what you are looking for and they will recommend some stunning locations! After looking at their work, it's definitely worth every penny! We are very pleased with their work and we really enjoyed working with them. We will definitely look them up again when we go back to Hawaii!"